6 to 9 p.m.: Opening reception for ArtJam at 19 Hulfish Street in Princeton’s Palmer Square. The exhibit features national and local artists. Proceeds benefit HomeFront’s ArtSpace (the exhibit will be on view through June 6). 6:30 p.m.: Award-winning author and professor Eddie Glaude Jr. speaks at One Table Café at Trinity Church, Princeton. Reservations are required by May 17. RSVP by calling (609) 216-7770. 7 to 9 p.m.: Opening Night, Dancing Under the Stars at Hinds Plaza co-sponsored by Princeton Public Library and Central Jersey Dance. 8 a.m. to 1 p.m.: Annual Miki & Friends 5K Walk and Run for Attitudes in Reverse, a Princeton-based nonprofit whose mission is to save lives through mental-health and suicide-prevention education; Mercer County Park, East Picnic Area, West Windsor. 8 a.m. to 2 p.m.: Rummage and Bake Sale at Trinity Church, 1 Park Avenue in Rocky Hill. Rain or shine. 9:30 a.m. to 5:30 p.m.: Princeton Pong hosts the 2017 May OPEN Table Tennis Tournament. This is a 2-Star USATT-Sanctioned Tournament open to groups of all ages and skill levels. Entry deadline is May 19. Register by calling (609) 987-8500 or by visiting princetonpong.com. 10 a.m. to 1 p.m.: Princeton’s 7th Annual Wheels Rodeo at 400 Witherspoon Street. This event is designed for riders of bicycles, skateboards, and skates. Includes free helmets, bike safety checks, and raffles. 1 to 2:30 p.m.: Members of Princeton University’s chemistry department conduct hands-on experiments for budding scientists 5 and older. Co-sponsored by the library and the Princeton Chemistry Graduate Student Organization; Princeton Public Library. 7 to 9 p.m.: All-level Glowga at Intergral Yoga Community Center (IYCC) at Princeton Shopping Center. This upbeat flow class will involve back bends, arm balance, and inversions all set to glowing lights and great music. Register at www.iyccprinceton.org. 8:30 p.m.: The Rick Fiori Jazz Trio performs at Small World Coffee’s Witherspoon Street location. 8:30 a.m.: The Princeton 5K in and around the Princeton High School neighborhood. Proceeds benefit the PHS cross country and track teams. Register at www.princeton5k.com. 8:30 a.m.: Bucks County 10-Miler through New Hope, Pa. and Delaware Canal State Park. For more information, visit www.runbucks.com. 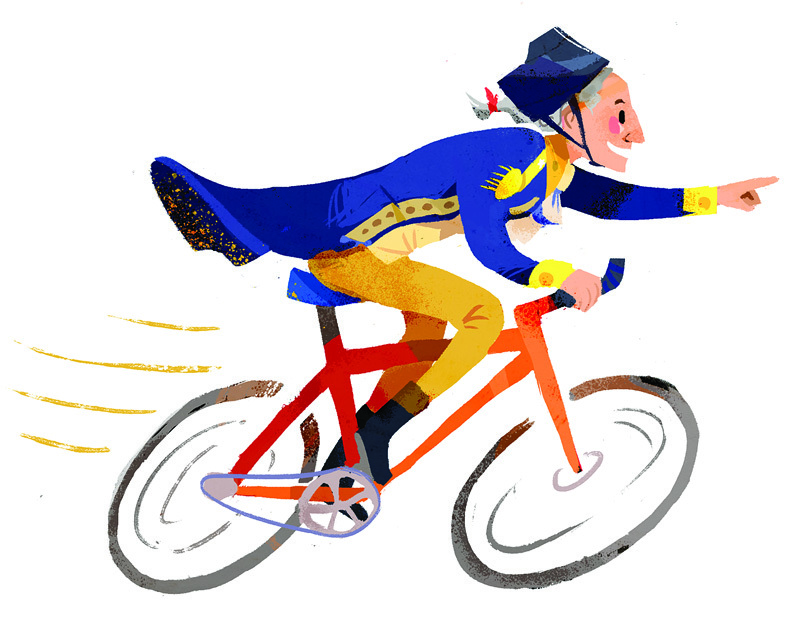 12:30 to 4 p.m.: The Historical Society of Princeton’s “Chasing George” 10-mile bike ride joins PBAC’s Ciclovia at Quaker Road, which will be closed to cars. Feet and people-powered wheels are welcome. 1 to 4 p.m.: Spring Music Series at Terhune Orchards. Come enjoy live music and wine tastings on the farm. 2 to 5 p.m.: Coming Home: An Embodiment Workshop with Joy Okoye at Integral Yoga Community Center (IYCC) at Princeton Shopping Center. The workshop will use yoga, JourneyDance, and other expressive arts for self-inquiry. Register at www.iyccprinceton.org. 3 p.m.: Sharim v’Sharot (People of Song), a choral foundation under the leadership of Dr. Elayne Robinson Grossman, will perform songs of peace in Jewish perspectives at 101 Scotch Road in Ewing. 3 p.m.: Special Exhibition Tour: “The Berlin Painter and His World: Athenian Vase-Painting in the Early Fifth Century B.C.” at Princeton University Art Museum. 3 p.m.: The English-Speaking Union presents John Burkhalter and Sheldon Eldridge in “Unheard Musick and Eighteenth Century British Literature” at The Kirby Arts Center at The Lawrenceville School. 4 to 6 p.m.: Princeton Pro Musica performs at Richardson Auditorium.